Objectives: Vegetarian diets have been shown to improve insulin resistance and reduce body weight, but the effects on nonalcoholic fatty liver require further confirmation. We aim to investigate the association between vegetarian diets, major food groups, and nonalcoholic fatty liver, and to compare the degree of liver fibrosis between vegetarians and nonvegetarians in those with fatty liver. Materials and Methods: We analyzed cross-sectional data from the Tzu Chi Health Study which included 2127 nonvegetarians and 1273 vegetarians who did not smoke or habitually drink alcohol and had no hepatitis B or hepatitis C. Fatty liver and liver fibrosis were determined using ultrasonography and the nonalcoholic fatty liver disease fibrosis score, respectively. Diet was assessed through a validated food frequency questionnaire. Results: Vegetarian diets were associated with lower odds of fatty liver (odds ratio = 0.79, 95% confidence interval: 0.68–0.91) after adjusting for age, gender, education, history of smoking and alcohol drinking. Adjustment for body mass index (BMI) attenuated the protective association. Vegetarians had less severe fibrosis than nonvegetarians. Replacing a serving of soy with a serving of meat or fish was associated with 12%–13% increased risk, and replacing a serving of whole grains with a serving of refined grains, fruits, and fruit juice was associated with 3%–12% increased the risk of fatty liver. Conclusion: Vegetarian diets, replacing meat and fish with soy, and replacing refined carbohydrates with whole grains, may be inversely associated with nonalcoholic fatty liver related to BMI. Tina H Chiu and Ming-Nan Lin contributed equally to this study. Nonalcoholic fatty liver disease (NAFLD) is emerging as a global epidemic and is the most common form of chronic liver disease worldwide, affecting of 20%–30% of the global population,. It increases hepatic glucose production, exacerbates insulin resistance, and plays a mechanistic role in the pathophysiology of diabetes, cirrhosis, and liver cancer,. NAFLD may range from simple steatosis, nonalcoholic steatohepatitis (NASH), and fibrosis to cirrhosis. Compared with simple steatosis, those with inflammation and NASH are at higher risk of progressing to fibrosis and advanced hepatic diseases. Although NAFLD is major public health problem, there are currently no approved medications or procedures for treatment. As NAFLD is highly associated with metabolic syndrome and obesity, diet and physical activity to promote weight loss are the standard treatment for NAFLD, but the optimal diet to prevent and reverse NAFLD has yet to be determined,. Insulin resistance and oxidative stress are major contributors in NAFLD progression, and thus may be key targets (besides caloric reduction) in dietary considerations. Vegetarian diets have been shown to improve insulin resistance and reduce body weight, more effectively than nonvegetarian therapeutic diets. Moreover, plant foods are the main sources of antioxidants and anti-inflammatory phytochemicals, which may ameliorate NAFLD. In this cross-sectional study, we aim to (1) study the association between vegetarian diets and nonalcoholic fatty liver, (2) examine the relationship between specific dietary components and fatty liver, and (3) compare the degree of liver fibrosis between vegetarians and nonvegetarians in those with fatty liver. We hypothesize that vegetarian diets are associated with reduced risks for nonalcoholic fatty liver and fibrosis. A total of 4625 Tzu Chi volunteers (18–87 years old) were recruited in the Tzu Chi Health Study from 2007 to 2009. Tzu Chi volunteers are devoted Buddhists who abstain from alcohol and tobacco, and about one-third of these volunteers were vegetarians. All participants received a comprehensive health examination at Dalin Tzu Chi General Hospital, including anthropometrics, blood chemistry, and abdominal sonography. The study was conducted in accordance with the Declaration of Helsinki and approved by the Institutional Review Board at Dalin Tzu Chi Hospital. All participants gave written informed consent before enrollment. Trained research assistants interviewed each participant on personal data, family history of diseases, personal medical history and use of medication, diet, and lifestyle. Their detailed diet was assessed through a 64-item quantitative food frequency questionnaire (FFQ) that had been validated with a subpopulation of the cohort and showed good validity for energy and major nutrients compared with diet records and biomarkers. The correlations (from the same validation study) between the FFQ and diet records were 0.41, 0.46, 0.55, 0.47, 0.39, 0.47, 0.30, and 0.68 for soy, meat, fish, eggs, dairy, vegetables, fruits, and grains, respectively. Vegetarians were defined as those who completely avoided meat, fish, and all animal flesh as determined in the FFQ interview. Each serving of a protein-rich food – soy, meat, fish, eggs, and dairy – was defined as 7 g of protein. Each serving of a carbohydrate-rich food – whole grains, refined grains, fruit, and fruit juice – was defined as 15 g of carbohydrates. Height and weight were measured using a digital scale. Body mass index (BMI) was calculated by dividing the weight (kg) by the square of the height (m2). Waist circumference (WC) was measured at the navel with participants standing in an upright position. Fasting glucose, total cholesterol, high-density lipoprotein (HDL) cholesterol, triglycerides (TG), albumin, gamma-glutamyl transpeptidase (GGT), aspartate aminotransferase (AST), and alanine aminotransferase (ALT) were measured using the INTEGRA 800 system (Roche Diagnostics, Indianapolis, IN, USA); platelets were measured using an automated hematology system (Sysmex, Chuo-ku, Kobe, Japan); hepatitis B virus surface antigen and hepatitis C virus antibody were assessed using the Johnson and Johnson Vitro Eci System (Ortho Clinical Diagnostics, Raritan, NJ, USA); all biochemical tests were performed by the hospital laboratory. Systolic blood pressure (SBP) and diastolic blood pressure (DBP) were measured using the VP 1000 System (Colin Co, Ltd, Komaki, Japan). Metabolic syndrome was defined by meeting at least three of the risk criteria in the third report of the National Cholesterol Education Program, Adult Treatment Panel III: fasting glucose ≥100 mg/dL or on hypoglycemic medication, SBP ≥130 mmHg or DBP ≥85 mmHg or on antihypertensive medication, HDL <40 mg/dL for men or <50 mg/dL for women, TG ≥150 mg/dL, WC ≥90 cm for men or ≥80 cm for women (Taiwanese criteria). The presence of diabetes mellitus was determined through a questionnaire interview and fasting blood glucose; details were reported in a previous publication. Fatty liver was evaluated by abdominal sonography performed by hospital gastroenterologists, who compared the liver echogenicity with that of the cortex of the kidney. The NAFLD fibrosis score was calculated according to the following formula. A NAFLD fibrosis score <−1.455 is considered to be no fibrosis to fibrosis stage 2 (low-fibrosis score); −1.455–0.676 is considered indeterminate fibrosis, while a score >0.676 is considered advanced fibrosis (stage 3 and 4). These cutoff points were shown to have high accuracy in determining stages of liver fibrosis when validated with liver biopsy. To eliminate cases of fatty liver caused by alcohol, smoking, or other medical conditions and medications, participants were excluded from the analysis if they reported current drinking of alcohol (n = 169) or current smoking (n = 79), having positive hepatitis B virus surface antigen or a reported history of hepatitis B (n = 818), having positive hepatitis C virus antibody or a reported history of hepatitis C (n = 233), or a reported history of cancer (n = 172). This left a total of 3400 participants in the final analysis. For the analyses of food groups or food substitution, we attempted to improve our estimates of the food – disease association and minimize errors associated with the FFQ by excluding 121 participants (n = 3279 included) with implausible caloric intake (men: energy intake <800 kcal or >4000 kcal and women: energy intake <500 kcal or >3500 kcal) as assessed by the FFQ. The independent sample t-test (for continuous variables) and the Chi-square test (for categorical variables) were used to compare personal and selected health characteristics between vegetarians and nonvegetarians. TG, GGT, ALT, and AST were loge transformed to improve normality before performing the t-test. Logistic regression analysis was used to study the association between (1) fatty liver and vegetarian diet, (2) fatty liver and major food groups, and (3) fatty liver and food substitution. 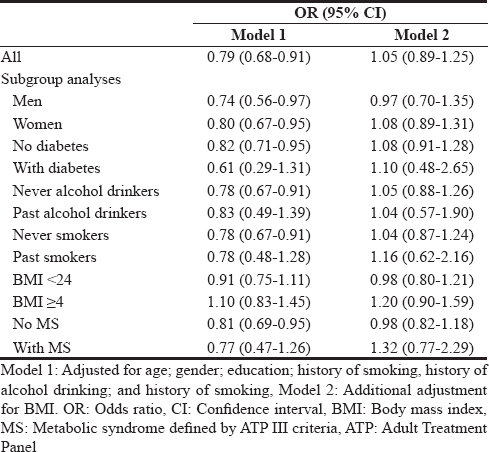 We examined these associations in two models, model 1 adjusted for age, gender, education, history of smoking, history of alcohol drinking, and model 2 additionally adjusted for BMI, as these factors differ between vegetarians and nonvegetarians and were associated with nonalcoholic fatty liver in our study, and could potentially confound our analysis. Leisure time physical activities were not included in the final analysis as they made no difference in the results. For food groups and food substitution analyses, total energy intake and vegetarian dietary patterns were also adjusted. For the association between vegetarian diet and fatty liver, we also conducted subgroup analyses by gender, diabetes status, history of alcohol drinking and smoking, BMI, and metabolic syndrome status. In addition, we conducted sensitivity analyses among those with hepatitis B and hepatitis C (who were excluded from our main analyses). Where P is the probability for a person to have fatty liver z, zi is covariate. In the above model, β1 is interpreted as the risk associated with increasing one serving of meat while the total amount of meat and soy is held constant. When the total amount of soy and meat is held constant, an increase in one serving of meat implies a simultaneous decrease in one serving of soy. Therefore, β1 may be interpreted as the effect of substituting a serving of meat (7 g protein equivalent) for a serving of soy (7 g protein equivalent) on loge(P/(1– P)). This substitution model has been described in more detail previously and was applied to all of our substitution analyses. All analyses were conducted using SAS 9.4 (SAS Institute, Cary, NC, USA). [Table 1] compares the personal and health characteristics of nonvegetarians and vegetarians. The vegetarian group was older and less likely to have a history of smoking or alcohol drinking, had a higher proportion of women, and a lower proportion of participants with fatty liver (52% vs. 59%), and had received less education. Vegetarians had lower levels of liver enzymes (GGT, ALT, and AST), glucose, WC, and all types of cholesterol, lower blood pressure values, and a lower prevalence of diabetes while there was no significant difference in TG and metabolic syndrome. Although vegetarians had lower HDL levels, their total to HDL cholesterol ratio was actually lower than the nonvegetarians. Among the 3400 participants, 1911 were found to have fatty liver on ultrasound. Logistic regression analysis of the association between vegetarian diets and fatty liver is shown in [Table 2]. Vegetarian diets were associated with a lower risk of fatty liver (odds ratio [OR] = 0.79, 95% confidence interval [CI]: 0.68, 0.91) in model 1 (adjusted for age, gender, education, history of smoking, and history of alcohol drinking). This protective association attenuated after further adjustment for BMI in model 2. Similar trends were observed in subgroup analyses by gender, history of drinking or smoking, and presence of diabetes or metabolic syndrome. Stratification by BMI also fully accounted for the protective association of vegetarian diets (for BMI <24 kg/m2: OR = 0.91, 95% CI = 0.75, 1.11; for BMI ≥24 kg/m2: OR = 1.10, 95% CI = 0.83, 1.45). In our sensitivity analysis, vegetarian diets were inversely associated with fatty liver (when BMI was not adjusted) among those with hepatitis B (n = 718; model 1: OR = 0.68, 95% CI = 0.49, 0.91; model 2: OR = 0.86, 95% CI = 0.61, 1.23) but not those with hepatitis C (n = 203; model 1: OR = 1.08, 95% CI = 0.59, 1.99; model 2: OR = 1.21, 95% CI = 0.63, 2.32). Among the 1911 participants with fatty liver, only one vegetarian and fourteen nonvegetarians had NAFLD fibrosis scores >0.676 (advanced fibrosis). Vegetarians had a lower mean score than nonvegetarians (−4.168 vs. −3.914) and were less likely to have advanced fibrosis [Figure 1]. The association between food groups and fatty liver in isocaloric conditions is presented in [Table 3]. Fatty liver was associated with a higher intake of meat (OR = 1.09, 95% CI = 1.01, 1.18), fish (OR = 1.09, 95% CI = 1.00, 1.20), and fruits/fruit juice (OR = 1.07, 95% CI = 1.01, 1.13). Other animal protein foods such as dairy and eggs were associated with nonsignificant increases in risk. Whole grains appeared to be protective (OR = 0.96, 95% CI = 0.94, 0.98), while soy was associated with a nonsignificant protection, although the magnitude of protection was comparable to whole grains. 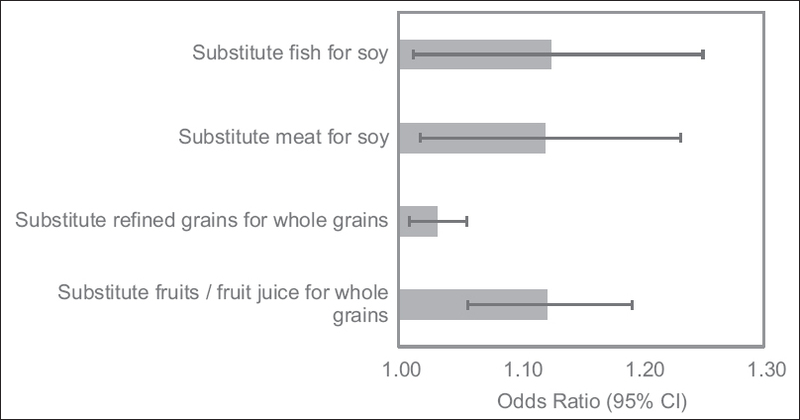 Substituting meat or fish for soy and substituting refined grains or fruits/fruit juice for whole grains were associated with increased risk of fatty liver [Figure 2]. We found that vegetarian diets were protectively associated with fatty liver likely due to lower BMI, as adjustment for BMI attenuated the association. This finding was consistent across gender, history of smoking and alcohol drinking, and status of diabetes, metabolic syndrome or hepatitis B. Substituting soy for meat or fish, or substituting whole grains for refined carbohydrates may be protective, independent of the vegetarian dietary pattern. In addition, we found that the prevalence of fatty liver was very high (>80%) in participants with diabetes, metabolic syndrome, elevated TG, or high WC. Vegetarians tended to have lower NAFLD fibrosis scores than nonvegetarians. The protective association before BMI adjustment found in our study is consistent with a previous study in India where a nonvegetarian pattern was associated with nonalcoholic fatty liver. BMI appeared to be an important mediator for the protective association between a vegetarian diets and fatty liver in our study. Controlling for BMI attenuated the protective association in both our study (through model adjustment and stratification) and in Choi et al. 's study (through matching for BMI and metabolic syndrome in the research design). 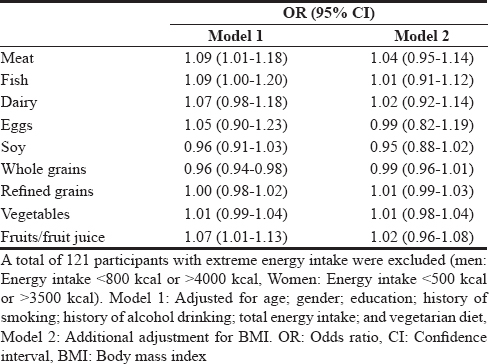 Meta-analyses of randomized controlled trials showed that vegetarian diets tend to reduce BMI,. Plant-based foods such as whole grains, fruits, vegetables, and nuts are rich in fiber, and were found to have 10%–20% lower metabolizable energy than that calculated from the Atwater factors typically used in food composition tables,,. The lower metabolizable (bioavailable) energy may therefore contribute to the lower BMI in vegetarians. Our results also indicate that vegetarian diets may be associated with less significant liver fibrosis, suggesting lower severity of NAFLD. Vegetarian diets have consistently been shown to reduce cholesterol levels, and cholesterol crystal formation in liver fat droplets may drive the progression of simple steatosis to NASH. In addition, oxidative stress, insulin resistance, and inflammation are important determinants of NAFLD progression. Iron from plant-based foods is less bioavailable than from meat, and vegetarians tend to have lower iron stores than nonvegetarians. Iron may increase oxidative stress and insulin resistance,, and iron overload may augment the risk of NASH. On the other hand, polyphenols from plant-based foods may reduce oxidative stress, inflammation, and insulin resistance, thereby reducing NAFLD progression,. The lower NAFLD fibrosis score in vegetarians found in our study may imply future reduction in mortality, particularly cardiovascular mortality. Typical Taiwanese dietary patterns are centered on rice, with many side dishes of stewed or stir-fried vegetables, fish, and meat. Vegetarians usually have a similar pattern, except they replace meat and fish with soy. Our substitution analysis showed that replacing a serving of soy with a serving of meat or fish is associated with an increased risk of fatty liver. Meat consumption was associated with NAFLD independent of BMI in an Israeli population. A dietary pattern characterized by animal foods was also associated with NAFLD in a middle-aged Chinese population. Meat and other animal foods are major sources of cholesterol and saturated fat, which may contribute to hepatic lipotoxicity,. A 7-week clinical trial found that overfeeding saturated fat compared with polyunsaturated fat causes fat accumulation in the liver. Dietary fat and cholesterol have also been shown to interact synergistically to induce NASH. On the other hand, soy may reduce hepatic lipogenesis and isoflavone from soy may enhance hepatic fat oxidation. Randomized controlled trials have demonstrated that diets low in carbohydrates reduce liver fat more effectively than high carbohydrate diets,. However, these trials were not designed to distinguish between types of carbohydrates. While refined grains were associated with NAFLD, whole grains may be associated with a lower likelihood of NASH, possibly mediated through lowering of abdominal obesity and inflammation. Whole grains are rich in fiber, which stimulates gut microbiota production of short chain fatty acids such as butyrates, thereby lowering inflammation and hepatic lipid synthesis,,. The inverse association between whole grains and fatty liver in our study further suggests that whole grains may be protective and should be used instead of refined grains as part of a healthy diet. The positive association between fruits/fruit juice and fatty liver in our study is inconsistent with another cross-sectional study in Hong Kong, which showed an inverse association between fruits and NAFLD. The effect of fruits on related metabolic diseases, such as diabetes, has also been inconsistent and inconclusive,,,. One limitation of our study is that fruits and fruit juices were combined into the same FFQ item, and this hampered our ability to separate the effect of fruits from fruit juice. Fruits and fruit juice are rich in fructose, and excess fructose may stimulate lipogenesis and suppress mitochondrial fatty acid oxidation. However, clinical trials examining the effect of fructose on fatty liver tended to be confounded by excess energy intake, and researchers were unable to make conclusions on the isocaloric effect of fructose. To make sound recommendations on fruits for fatty liver prevention and management, more studies are needed to (1) distinguish the lipogenic effects between different fruits and fruit juices, and (2) find the threshold for fructose tolerance for individuals at risk of fatty liver. This is especially important given that fruits are essential to a healthy diet, and contain beneficial anti-inflammatory and antioxidative polyphenols, which may be essential in reducing inflammation and oxidative stress in individuals with NAFLD. Despite a lower BMI, the prevalence of nonalcoholic fatty liver in our population (56%) was higher than previously reported in the general US population (34%, as assessed in the 1988–1994 National Health and Nutrition Examination Survey, which also assessed fatty liver by ultrasonography with diagnostic criteria similar to our study). While this may be due to the difference in age (our population was 15 years older), Asians are also more susceptible to metabolic obesity. In working with Asians, health professionals and public health educators should be aware of potential NAFLD disguised under a normal BMI; early dietary intervention focusing on wholesome plant-based foods may be initiated at signs of weight gain, possibly even before the onset of metabolic syndrome, TG elevation, and diabetes. One limitation of the current study is that the cross-sectional design does not allow elucidation of causal relationship. Another limitation is that the use of ultrasonography to determine the presence of fatty liver is subjective, and cannot distinguish simple steatosis and NASH and fibrosis. Although ultrasonography is not perfect, a meta-analysis concluded that it has good reliability and accuracy for detecting moderate to severe fatty liver, compared with a biopsy, which is invasive and impractical, if not unethical, in epidemiological settings. Future follow-up to ascertain the incidence and progression of the liver condition is needed to more definitively understand the impact of a vegetarian diet and its components on NAFLD. By limiting our study participants to a specific religious group, we could potentially reduce confounding effects associated with religion-related psychological and lifestyle factors, and thereby strengthen internal validity. The generalizability of our results requires further confirmation in other populations. A vegetarian diet was inversely associated with fatty liver through lowering the BMI. This research suggests that choosing soy over meat or fish, and choosing whole grains over refined carbohydrates may prevent fatty liver. The authors wish to thank Mrs. Brenda Davis, registered dietitian from Kelowna, BC, Canada; Dr. Yen-Feng Chiu, statistician from the National Health Research Institute in Taiwan; and Ms. Joyce Chen, dietitian from the Tzu Chi Medical Foundation in Taiwan for proof-reading and suggesting changes to improve the clarity of the manuscript. The study was funded by research grants (TCRD-I9605-02) from Dalin Tzu Chi Hospital and (TCMMPSP104-08-01 and TCMMP105-13-04) from the Buddhist Tzu Chi Medical Foundation. The funders had no role in the study design, data collection and analysis, decision to publish, or preparation of the manuscript. Loomba R, Sanyal AJ. The global NAFLD epidemic. Nat Rev Gastroenterol Hepatol 2013;10:686-90. Younossi ZM, Koenig AB, Abdelatif D, Fazel Y, Henry L, Wymer M, et al. Global epidemiology of nonalcoholic fatty liver disease-meta-analytic assessment of prevalence, incidence, and outcomes. Hepatology 2016;64:73-84. Rinella ME. Nonalcoholic fatty liver disease: A systematic review. JAMA 2015;313:2263-73. Shulman GI. Ectopic fat in insulin resistance, dyslipidemia, and cardiometabolic disease. N Engl J Med 2014;371:1131-41. Kleiner DE, Brunt EM, Van Natta M, Behling C, Contos MJ, Cummings OW, et al. Design and validation of a histological scoring system for nonalcoholic fatty liver disease. Hepatology 2005;41:1313-21. Singh S, Allen AM, Wang Z, Prokop LJ, Murad MH, Loomba R, et al. Fibrosis progression in nonalcoholic fatty liver vs. nonalcoholic steatohepatitis: A systematic review and meta-analysis of paired-biopsy studies. Clin Gastroenterol Hepatol 2015;13:643-540. Yki-Järvinen H. Non-alcoholic fatty liver disease as a cause and a consequence of metabolic syndrome. Lancet Diabetes Endocrinol 2014;2:901-10. Hernandez-Rodas MC, Valenzuela R, Videla LA. Relevant aspects of nutritional and dietary interventions in non-alcoholic fatty liver disease. Int J Mol Sci 2015;16:25168-98. Videla LA, Rodrigo R, Araya J, Poniachik J. Insulin resistance and oxidative stress interdependency in non-alcoholic fatty liver disease. Trends Mol Med 2006;12:555-8. Kahleova H, Matoulek M, Malinska H, Oliyarnik O, Kazdova L, Neskudla T, et al. Vegetarian diet improves insulin resistance and oxidative stress markers more than conventional diet in subjects with type 2 diabetes. Diabet Med 2011;28:549-59. Barnard ND, Levin SM, Yokoyama Y. A systematic review and meta-analysis of changes in body weight in clinical trials of vegetarian diets. J Acad Nutr Diet 2015;115:954-69. Huang RY, Huang CC, Hu FB, Chavarro JE. Vegetarian diets and weight reduction: A meta-analysis of randomized controlled trials. J Gen Intern Med 2016;31:109-16. Carlsen MH, Halvorsen BL, Holte K, Bøhn SK, Dragland S, Sampson L, et al. The total antioxidant content of more than 3100 foods, beverages, spices, herbs and supplements used worldwide. Nutr J 2010;9:3. Joseph SV, Edirisinghe I, Burton-Freeman BM. Fruit polyphenols: A review of anti-inflammatory effects in humans. Crit Rev Food Sci Nutr 2016;56:419-44. Rodriguez-Ramiro I, Vauzour D, Minihane AM. Polyphenols and non-alcoholic fatty liver disease: Impact and mechanisms. Proc Nutr Soc 2016;75:47-60. Chiu TH, Huang HY, Chen KJ, Wu YR, Chiu JP, Li YH, et al. Relative validity and reproducibility of a quantitative FFQ for assessing nutrient intakes of vegetarians in Taiwan. Public Health Nutr 2014;17:1459-66. American Heart Association; National Heart, Lung, and Blood Institue, Grundy SM, Cleeman JI, Daniels SR, Donato KA, Eckel RH, et al. Diagnosis and management of the metabolic syndrome. An American Heart Association/National Heart, Lung, and Blood Institute Scientific Statement. Executive summary. Cardiol Rev 2005;13:322-7. Chiu TH, Huang HY, Chiu YF, Pan WH, Kao HY, Chiu JP, et al. 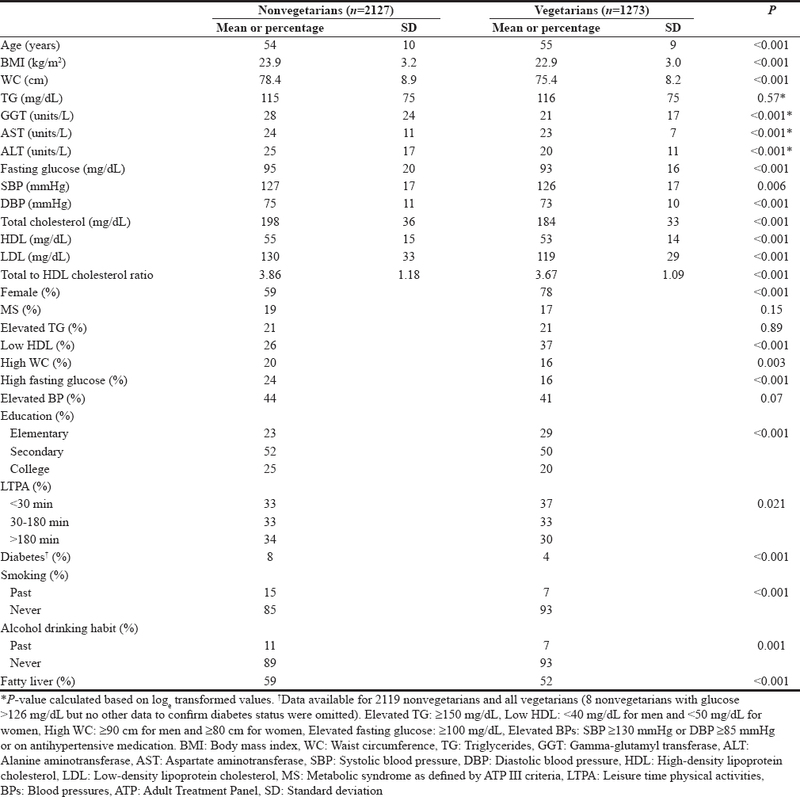 Taiwanese vegetarians and omnivores: Dietary composition, prevalence of diabetes and IFG. PLoS One 2014;9:e88547. Tchelepi H, Ralls PW, Radin R, Grant E. Sonography of diffuse liver disease. J Ultrasound Med 2002;21:1023-32. Angulo P, Hui JM, Marchesini G, Bugianesi E, George J, Farrell GC, et al. The NAFLD fibrosis score: A noninvasive system that identifies liver fibrosis in patients with NAFLD. Hepatology 2007;45:846-54. Willett W. Nutritional epidemiology. 3rd ed. Oxford, New York: Oxford University Press; 2013, p. 529. Faerch K, Lau C, Tetens I, Pedersen OB, Jørgensen T, Borch-Johnsen K, et al. A statistical approach based on substitution of macronutrients provides additional information to models analyzing single dietary factors in relation to type 2 diabetes in danish adults: The Inter99 study. J Nutr 2005;135:1177-82. Singh SP, Singh A, Misra D, Misra B, Pati GK, Panigrahi MK, et al. Risk factors associated with non-alcoholic fatty liver disease in Indians: A case-control study. J Clin Exp Hepatol 2015;5:295-302. Choi SH, Oh DJ, Kwon KH, Lee JK, Koh MS, Lee JH, et al. A vegetarian diet does not protect against nonalcoholic fatty liver disease (NAFLD): A cross-sectional study between Buddhist priests and the general population. Turk J Gastroenterol 2015;26:336-43. Zou ML, Moughan PJ, Awati A, Livesey G. Accuracy of the atwater factors and related food energy conversion factors with low-fat, high-fiber diets when energy intake is reduced spontaneously. Am J Clin Nutr 2007;86:1649-56. Novotny JA, Gebauer SK, Baer DJ. Discrepancy between the atwater factor predicted and empirically measured energy values of almonds in human diets. Am J Clin Nutr 2012;96:296-301. Baer DJ, Gebauer SK, Novotny JA. Walnuts consumed by healthy adults provide less available energy than predicted by the atwater factors. J Nutr 2016;146:9-13. Wang F, Zheng J, Yang B, Jiang J, Fu Y, Li D, et al. Effects of vegetarian diets on blood lipids: A systematic review and meta-analysis of randomized controlled trials. J Am Heart Assoc 2015;4:e002408. Ioannou GN, Haigh WG, Thorning D, Savard C. Hepatic cholesterol crystals and crown-like structures distinguish NASH from simple steatosis. J Lipid Res 2013;54:1326-34. Hunt JR. Bioavailability of iron, zinc, and other trace minerals from vegetarian diets. Am J Clin Nutr 2003;78:633S-9S. Ball MJ, Bartlett MA. Dietary intake and iron status of Australian vegetarian women. Am J Clin Nutr 1999;70:353-8. Hua NW, Stoohs RA, Facchini FS. Low iron status and enhanced insulin sensitivity in lacto-ovo vegetarians. Br J Nutr 2001;86:515-9. Rajpathak SN, Crandall JP, Wylie-Rosett J, Kabat GC, Rohan TE, Hu FB, et al. The role of iron in type 2 diabetes in humans. Biochim Biophys Acta 2009;1790:671-81. Fargion S, Mattioli M, Fracanzani AL, Sampietro M, Tavazzi D, Fociani P, et al. Hyperferritinemia, iron overload, and multiple metabolic alterations identify patients at risk for nonalcoholic steatohepatitis. Am J Gastroenterol 2001;96:2448-55. Bozzetto L, Annuzzi G, Pacini G, Costabile G, Vetrani C, Vitale M, et al. Polyphenol-rich diets improve glucose metabolism in people at high cardiometabolic risk: A controlled randomised intervention trial. Diabetologia 2015;58:1551-60. Kim D, Kim WR, Kim HJ, Therneau TM. Association between noninvasive fibrosis markers and mortality among adults with nonalcoholic fatty liver disease in the United States. Hepatology 2013;57:1357-65. Zelber-Sagi S, Nitzan-Kaluski D, Goldsmith R, Webb M, Blendis L, Halpern Z,et al. Long term nutritional intake and the risk for non-alcoholic fatty liver disease (NAFLD): A population based study. J Hepatol 2007;47:711-7. Yang CQ, Shu L, Wang S, Wang JJ, Zhou Y, Xuan YJ, et al. Dietary patterns modulate the risk of non-alcoholic fatty liver disease in Chinese adults. Nutrients 2015;7:4778-91. Leamy AK, Egnatchik RA, Young JD. Molecular mechanisms and the role of saturated fatty acids in the progression of non-alcoholic fatty liver disease. Prog Lipid Res 2013;52:165-74. Papandreou D, Karabouta Z, Rousso I. Are dietary cholesterol intake and serum cholesterol levels related to nonalcoholic fatty liver disease in obese children? Cholesterol 2012;2012:572820. Rosqvist F, Iggman D, Kullberg J, Cedernaes J, Johansson HE, Larsson A, et al. Overfeeding polyunsaturated and saturated fat causes distinct effects on liver and visceral fat accumulation in humans. Diabetes 2014;63:2356-68. Savard C, Tartaglione EV, Kuver R, Haigh WG, Farrell GC, Subramanian S, et al. Synergistic interaction of dietary cholesterol and dietary fat in inducing experimental steatohepatitis. Hepatology 2013;57:81-92. Oliveira LP, de Jesús RP, Freire TO, Oliveira CP, Castro Lyra A, Lyra LG, et al. Possible molecular mechanisms soy-mediated in preventing and treating nonalcoholic fatty liver disease. Nutr Hosp 2012;27:991-8. Browning JD, Baker JA, Rogers T, Davis J, Satapati S, Burgess SC, et al. Short-term weight loss and hepatic triglyceride reduction: Evidence of a metabolic advantage with dietary carbohydrate restriction. Am J Clin Nutr 2011;93:1048-52. Ryan MC, Itsiopoulos C, Thodis T, Ward G, Trost N, Hofferberth S, et al. The mediterranean diet improves hepatic steatosis and insulin sensitivity in individuals with non-alcoholic fatty liver disease. J Hepatol 2013;59:138-43. Georgoulis M, Kontogianni MD, Tileli N, Margariti A, Fragopoulou E, Tiniakos D, et al. The impact of cereal grain consumption on the development and severity of non-alcoholic fatty liver disease. Eur J Nutr 2014;53:1727-35. Ross AB, Godin JP, Minehira K, Kirwan JP. Increasing whole grain intake as part of prevention and treatment of nonalcoholic fatty liver disease. Int J Endocrinol 2013;2013:585876. Cox AJ, West NP, Cripps AW. Obesity, inflammation, and the gut microbiota. Lancet Diabetes Endocrinol 2015;3:207-15. Leung C, Rivera L, Furness JB, Angus PW. The role of the gut microbiota in NAFLD. Nat Rev Gastroenterol Hepatol 2016;13:412-25. Chan R, Wong VW, Chu WC, Wong GL, Li LS, Leung J, et al. Diet-quality scores and prevalence of nonalcoholic fatty liver disease: A population study using proton-magnetic resonance spectroscopy. PLoS One 2015;10:e0139310. Cooper AJ, Forouhi NG, Ye Z, Buijsse B, Arriola L, Balkau B, et al. Fruit and vegetable intake and type 2 diabetes: EPIC-InterAct prospective study and meta-analysis. Eur J Clin Nutr 2012;66:1082-92.
Cooper AJ, Sharp SJ, Lentjes MA, Luben RN, Khaw KT, Wareham NJ, et al. A prospective study of the association between quantity and variety of fruit and vegetable intake and incident type 2 diabetes. Diabetes Care 2012;35:1293-300. Softic S, Cohen DE, Kahn CR. Role of dietary fructose and hepatic de novo lipogenesis in fatty liver disease. Dig Dis Sci 2016;61:1282-93. Chung M, Ma J, Patel K, Berger S, Lau J, Lichtenstein AH, et al. Fructose, high-fructose corn syrup, sucrose, and nonalcoholic fatty liver disease or indexes of liver health: A systematic review and meta-analysis. Am J Clin Nutr 2014;100:833-49. Pagadala MR, McCullough AJ. Non-alcoholic fatty liver disease and obesity: Not all about body mass index. Am J Gastroenterol 2012;107:1859-61. Hernaez R, Lazo M, Bonekamp S, Kamel I, Brancati FL, Guallar E, et al. Diagnostic accuracy and reliability of ultrasonography for the detection of fatty liver: A meta-analysis. Hepatology 2011;54:1082-90.